An extraordinarily rare internally flawless purple-pink diamond could set a record when it hits the auction block at Sotheby’s Magnificent Jewels and Jadeite Autumn Sale on October 7. The auction house tagged the 8.41-carat pear-shaped diamond with a pre-sale estimate between $12.8 million and $15.4 million, or approximately $1.83 million per carat. 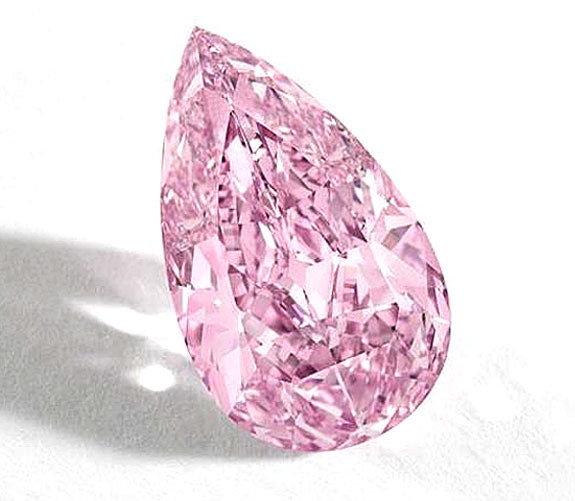 A Sotheby's official claimed the fancy vivid purple-pink diamond displays the most beautiful and concentrated shades of pink that he has ever seen. The Gemological Institute of America supported that assessment by bestowing the stone with its highest color rating. The 8.41-carat purple-pink sparkler was expertly cut in New York City from a De Beers-mined rough diamond weighing 19.54 carats. It is not unusual for a world-class diamond such as this one to lose half of its weight or more during the cutting process. The Sotheby’s October headliner is expected to come within striking distance of the highest price ever paid per carat for a fancy vivid pink diamond. That record is held by a 5-carat stone that sold at Christie’s Hong Kong in January 2009 for $10.8 million ($2.16 million per carat). The record for the highest price ever paid for any jewel at auction is held by the 24.67-carat Graff Pink, which sold in 2010 for $46.2 million ($1.86 million per carat). The 8.41-carat purple-pink diamond will be touring Singapore, Taipei, New York, London, Geneva and Hong Kong prior to what promises to be an exciting auction on October 7.